Five pristine islands make up Tunku Abdul Rahman National Park, with each idyllic setting comprising white beaches, offshore coral reefs and inland forests teeming with animal life. These destinations are all perfect for camping, trekking, swimming and snorkelling. Gaya Island is the largest of the five. Its status as a forest reserve since 1923 has helped preserve its dense tropical forest. 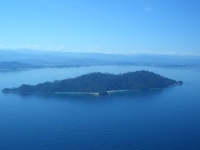 Manukan Island is the second largest and the most popular with Malaysian locals. Mamutik Island is the smallest, though it still has its share of loveliness. Travellers seeking tranquillity will love this beautiful retreat. Sapi Island is very popular with foreign tourists and can get quite crowded during the day. Lastly, Sulug Island is the most pristine and untouched of the chain, and the farthest from the mainland. It is the ideal destination for those seeking peace and quiet.